A tough easy to grow plant are Davallia ferns, commonly called the Hare’s Foot Fern. 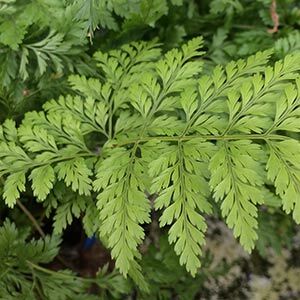 Attractive fronds and growing as both epiphytes and lithophytes they will also grow well in containers given the right growing medium. One of the more commonly grown species of Davallia ferns is Davallia solid var. pyxidata, found from Queensland through New South Wales to Victoria. These are a fern that will grow in fairly deep shade and require protection from direct sun for most of the day. Although they are commonly grown in hang ing baskets as well as mounted specimens, they will grow well in the ground as well. These are a fern that like consistently moist conditions,they also like good drainage. So a potting mix that provides this is ideal and you can easily amend a good quality commercial mix by adding some fine pine bark as well as some perlite. The pine bark will improve the drainage, and the perlite will assist with both drainage and moisture retention. The main problem with growing these ferns in the ground is to much water in winter, this can also be overcome by amending the soil to suit. Fertilizer is not generally required, although some applications of liquid seaweed fertiliser in spring and summer can be beneficial for most Davallia fern species.